When first encountering the myriad of features in Photoshop, it is common to see the Brush Tool, selecting it, and then wildly dragging the cursor all over the canvas. The inevitable result of this exercise is the assumption that all it does is to lay down swaths of color. Not quite. In fact brushes are used everywhere in Photoshop. the Eraser Tool, Dodge and Burn, Blur, Sharpen, Smudge and the Healing Brush are all brushes. The Brush panel and Brush presets. In no way is this to be regarded as a comprehensive overview of one of the most important tools in the Photoshop toolbox. Instead, it is designed to get you working with Photoshop brushes and give you the confidence to explore further creative possibilities with a tool that does more than slather on the pixels. Brush Preset: This pop down allows to choose the Brush Size, Brush Style, the Brush Hardness which, as shown, affects the edges of the stroke, The Brush angle, and roundness as well as the Brush Tip picker. Brush panel: Click this and the Brush panel which allows you to choose from a range of preset brushed that come packed with Photoshop as well as any brushes you may have created or added to Photoshop. Opacity: This slider adjusts the opacity of the brush. Pressure: Primarily used with tablets, such as those from Wacom, where a pen replaces the mouse. Flow: If you click on an area with this selected, the color gets more intense. Think of a regular paint brush. As you stroke across the wall, the paint tends to “fade” as the paint leaves brush and hits the wall. Same thing here but it works best with a pen. To adjust the size of any brush press the ]+key to increase the size and press the [+key to make it smaller. The adjust the hardness press Shift+] to increase the hardness and Shift+[ to reduce the hardness. The Brush panel options, shown above, hand you a number of options ranging from smooth brushes to brushes you would use if painting and even a series of brushes that add textures and even brushes that scatter leaves and grass across the canvas. To change the brush angle and its roundness, drag the dots at the top and bottom of the brush shape to change the angle or move the side dot inwards or outwards to change its shape. Photoshop also comes packaged with a rather large selection of assorted brushes. To access the collection of brushes, click the Gear button – the Panel Options – to open the context menu. The brushes that can be added are shown at the bottom of the drop-down. When you select a set of brushes you will be asked to append the brushes to the panel or to replace the current brushes with your choice. If you select Append the brushes will be added to those shown. To reset back to the default brushes, select Reset Brushes… in the pop-down menu. Choosing a brush from the Preset Picker in the Brush options is fairly standard but there is a lot you can do to customize those brushes to your needs. This is where the Brush panel (Window > Brush) and the Brush Presets panel (Window > Brush Presets) become your best friend. In fact, you don’t even have to use the Window menu to open the panels, click the Toggle The Brush panel button (It looks like a File Folder) to open the panels. The purpose of the Brush Presets panel is to show you what the brush looks like when painting and the menu open the menu. The Brushes panel is where the magic happens. When you select a brush you can affect its Tip – the items on the left – and when you choose an item the pane on the right will change to reflect your choice. Shape Dynamics: Select this and you can alter how the brush works as you drag it across the canvas. Scattering: Varies the placement and number of instances as you drag the brush. Texture: If you select a texture or pattern in the texture drop-down, you will paint with your choice rather than a solid color. This works best when the spacing is set to at least 50%. Dual Brush: works with Blending modes and adds a second brush over the original. Color Dynamics: This allows you to change the color of your stroke as you drag. Transfer: Use this to apply Opacity and Flow jitter — random spacing — to build up the color brushed onto the canvas. Brush Pose: Use this with a tablet and stylus. Noise: Adds noise to a brush stroke and adds a bit of texture. Wet Edges: Simulates the build-up of paint along the edges of a brush stroke. Smoothing: Select this to reduce sharp angles and so on when you drag the mouse. Protect Texture: Select this to ensure all brushes that have a texture feature use the same texture. Select the Rectangle Tool (U). In the options bar select Paths from the drop-down menu. Click and drag out a rectangular path in your document. Select the paintbrush tool (B). Click on Brush Presets and choose an appropriately-sized, hard, round brush. While you're in the Brush Presets panel, you can also adjust the diameter and hardness if desired. Open the Brush Panel and select Scattering. Set the Scatter value to 0%. Open the Paths Palette if it is not showing (Window > Paths). Click the Stroke path with brush button on the paths palette. Any path can be stroked with a brush. Selections can be converted to paths for stroking. You can save your custom brush as a preset by choosing New Brush from the brushes palette menu. Experiment with shaped brushes and the Scattering options in the brushes palette. There's some powerful stuff hidden in the brushes palette! In the above image, we have a photo of a road in Lauterbrunnen, Switzerland over another of a Cliffside waterfall. The plan is to remove the sky between the mountains and have the waterfall show through. This is a classic masking task. Select the top image in the layers panel and select Create Layer Mask. Reset the default colors to Black and White and make sure the Foreground color is black in the Tools panel. Select the Add a Mask button in the Layers panel. Select the Brush tool and click the Brush preset button – it looks like a file folder – in the Brush options toolbar. Select a soft round brush. You need this to ensure there is a bit of feathering when you paint along the edges of the mountains. Use the [ and ] keys to increases and decrease the size of the brush as you move closer to areas you want to preserve. To work on the edges, zoom in on the image and, if needed, increase or decrease the brush size. Don’t be afraid to experiment with different brushes found in the presets. There are a lot of interesting masking effects that can be achieved by using brushes you may have loaded or changed in the Brushes panel. Open a new Photoshop document and choose an appropriate size because it will be used as the default size for your brush. In this case, I chose 200 by 200. Set the Foreground color to black and select a hard round brush. A quick way of doing this is to press the Option+Alt key and, with the Brush tool selected, click on the canvas. Set the brush size to 5 or 10 pixels and draw a series of horizontal lines. Feel free to increase or decrease the brush size as you draw a line. When you are finished select Edit > Define Brush Preset. This will open the Brush Name dialog box where you can enter a name for your brush. 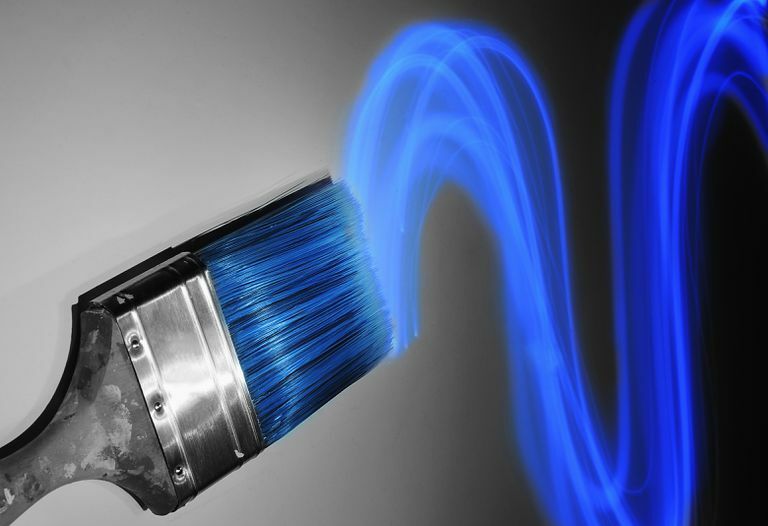 If you open the brush presets you will see your new brush has been added to the lineup. Being able to create brushes using a brush is interesting but you can also use an image as a brush. There are a couple of things you will need to know about this technique. The first is brushes are grayscale. With that in mind, you might want to convert the image to grayscale using an Adjustment layer before making it a brush. The second is a brush can only hold one color so, before using the brush, be sure you have the right color chosen as your foreground color. The final thing is to make sure to use one object like a leaf. With that out of the way, let’s make a brush. Open an image and reduce the image size to between 200 and 400 pixels wide. Select Image > Adjustments > Black and White. Use the color sliders to improve the contrast. In the case of this image, we moved the Red slider to a value of 11 to remove a lot of the Midtones. Select Edit > Define Brush Preset… and give the brush a name. We then opened the original image and, using the eyedropper tool, sampled the red in the leaf. We then drew a rectangle around the image and switched to the Brush Tool. The new brush was selected and the Brush panel opened. From there we clicked on Select Brush Tip Shape and chose a Tip size. In this case, we chose 100 px. To spread out the leaves being painted we moved the Spacing slider at the bottom to a value of about 144%. We then opened the Path panel and stroked the rectangle with the new brush.